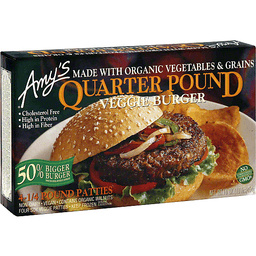 Amy's® Quarter Pound Veggie Burger. Family owned since 1988. Made with organic vegetables. Cholesterol free. High in protein. High in fiber. 50% Bigger Burger than our regular veggie burgers. Dairy free. Vegan. Four soy veggie patties. 4 - 1/4 Pound patties. Net Wt. 16 oz. (1.0 lbs) 454 g. After the birth of our daughter Amy in 1987 we found there was little time to prepare the wholesome nutritious food we normally ate. Realizing there were others like ourselves, we set up Amy's Kitchen to produce delicious, nourishing frozen meals for heatlh-conscious people too busy to cook. We use only the finestnatural and organic ingredients and prepare them with the same careful attention in our kitchen as you would in your own home. No meat, fish, shellfish, poultry, eggs or peanuts are ever used in any Amy's products. 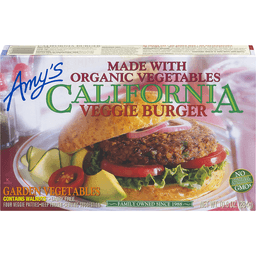 Burgers are a classic American food...and those who prefer not to eat meat will find that Amy's Quarter Pound Veggie Burger is just the thing to satisfy even the most avid burger fan. 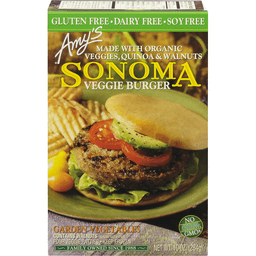 Amy's Quarter Pound Veggie Burger combines fresh organic grains and vegetables with protein-rich soybeans and a hint of barbecue sauce to create a firm, great tasting burger that's perfect for barbecuing or grilling. 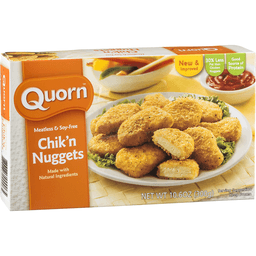 Just put one in a large-size bun, add all the "fixins" and you've got a delicious substantial meal that will satisfy the heartiest of eaters. Amy's Kitchen does not use any peanuts, fish, shellfish or eggs. 0g Trans fat. No added MSG. No preservatives. No GMOs - No bioengineered ingredients. Genetically engineered ingredients. Try our California Burger, Texas Burger, Cheddar Burger, All American Burger & Our Gluten Free Bistro and Sonoma Burgers. Certified Organic by QAI (Quality Assurance International). Carton is made from 100% recycled paperboard. Carton is recyclable. We like hearing from you. If you have any Questions or Comments, please write to us. Amy's Kitchen Inc., P.O. Box 449 Petaluma, CA 94953. Visit us at www.amys.com. © Amy's Kitchen. Eating well made easy. Free from common allergens. You are about to experience our yummy apple maple veggie breakfast sausage. 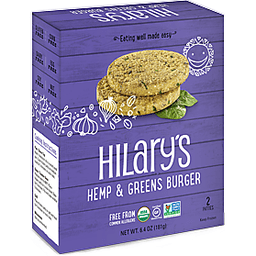 Hilary's makes delicious, culinary-inspired foods using real, minimally processed ingredients that are free from common allergens. It's convenience you can feel good about. Enjoy! Flavor & convenience in perfect harmony. Culinary recipes. Manufactured in a dedicated common allergen-free facility. USDA Organic. Certified gluten-free. Vegan. Certified organic by CCOF. Gluten free. Dairy free. Egg free. Certified B Corporation. Bcorporation.net. Non GMO Project verified. nongmoproject.org. Real ingredients. Made with solar power. Corn free. Soy free. Nut free. Visit Us at: www.hilaryseatwell.com. Follow us! (at)HilarysEatWell. Facebook. Twitter. Instagram. Pinterest. Please recycle. Product of USA. Made with organic veggies, quinoa & walnuts. Gluten free. Dairy free. Certified vegan. Vegan.org. Soy free. Garden vegetables. No genetically engineered ingredients - GMOs. In 1987, when Amy was born, we found we had little time to prepare the quality food we usually ate. Realizing there were others like us, we established Amy's Kitchen to produce convenient, nourishing meals for people who love good food but are often too busy to cook. Made with the highest quality ingredients and prepared with the same loving attention in our kitchens as is used in the home kitchens as is used in the home kitchen. Amy's meals contain no meat, fish, shellfish, poultry, eggs or peanuts and are delicious. We like hearing from you. If you have any questions or comments, please write to us: Amy's Kitchen Inc., PO Box 449 Petaluma, CA 94953. Certified organic by QAI. Certified Organic: Quality Assurance International. Certified vegan. Vegan.org. Carton is made from 100% recycled paperboard. Carton is recyclable. Visit us at amys.com. 0 g trans fat. No added MSG. No preservatives. No GMOs - No genetically engineered ingredients. Our family lives in Sonoma County, CA. Amy was born here and Amy's Kitchen began here. 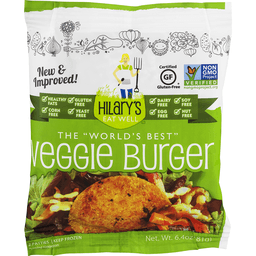 So it's fitting that we name our latest very special Veggie Burger after our hometown. Made with organic vegetables, mushrooms and quinoa, an ancient grain (pronounced keen wah), the Sonoma Burger is free from dairy, free from gluten and free from soy, but full of flavor. You'll love its light, fresh taste. For variety you'll also want to try our gluten free Bistro Burger. Made in USA. Fully cooked & browned. Gluten free. Soy free. Vegan. USDA organic. Non GMO Project verified. nongmoproject.org. Our tangy barbecue burger is made with organic pinto beans and spices, and has a hint of smoky sweetness. 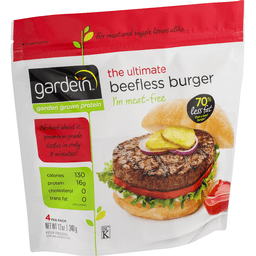 Tasty vegan burgers for all occasions. 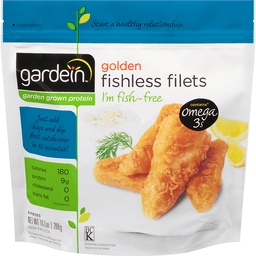 Gluten free, soy free, cholesterol free - and delicious! 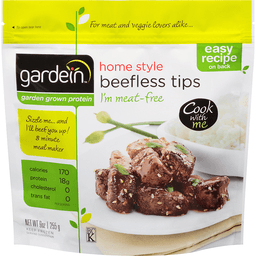 Made with flavorful and nutritious organic whole food ingredients. Nothing more! A source of plant-based protein. Verified non-GMO. NFC: Certified organic by Natural Food Certifiers, Inc. Visit us at SunshineBurger.com. Facebook: Facebook.com/SunshineBurger. Twitter: Twitter.com/SunshineBurger. Try all our flavors! In 1983, Carol started making Sunshine Burgers at home for her children. The recipe was such a success that a small business was born. 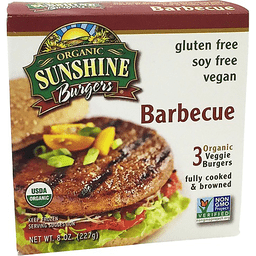 Since then, Sunshine Burger has been dedicated to offering you delicious, wholesome vegan burgers made with non-GMO, organic whole food ingredients. Our burgers are free of gluten, wheat, soy, corn, oats, dairy, eggs, tree nuts and peanuts. We hope you enjoy eating them as much as we like making them. We look forward to hearing from you! Recyclable paperboard packaging. Fully cooked & browned. Gluten free. Soy free. Vegan. USDA organic. Non GMO Project verified. nongmoproject.org. 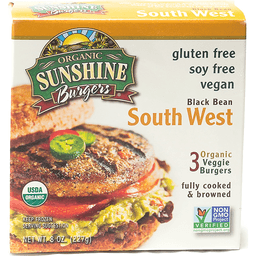 With jalapeno, cilantro and black beans, these vegan burgers add the flavors of the Southwest to any meal! Tasty vegan burgers for all occasions. Gluten free, soy free, cholesterol free - and delicious! 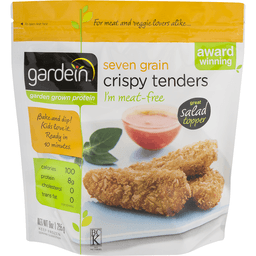 Made with flavorful and nutritious organic whole food ingredients. Nothing more! 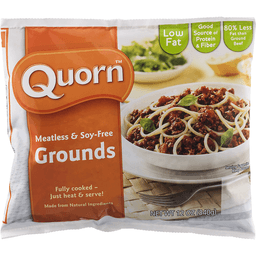 A source of plant-based protein. Verified non-GMO. NFC: Certified organic by Natural Food Certifiers, Inc. Visit us at SunshineBurger.com. Facebook: Facebook.com/SunshineBurger. Twitter: Twitter.com/SunshineBurger. Try all our flavors! In 1983, Carol started making Sunshine Burgers at home for her children. The recipe was such a success that a small business was born. 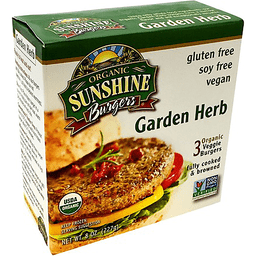 Since then, Sunshine Burger has been dedicated to offering you delicious, wholesome vegan burgers made with non-GMO, organic whole food ingredients. Our burgers are free of gluten, wheat, soy, corn, oats, dairy, eggs, tree nuts and peanuts. We hope you enjoy eating them as much as we like making them. We look forward to hearing from you! Paperboard packaging. Recyclable. 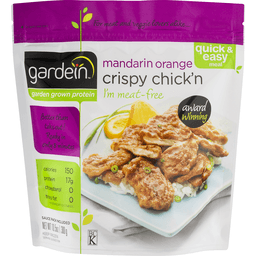 Eating well made easy! Always 100% real food. Healthy fats. Gluten free. Dairy free. Soy free. Corn free. Yeast free. Egg free. Nut free. A deliciously crunchy, easy-to-prepare patty made with gluten-free, vegan, non-GMO ingredients like millet, hemp, coconut oil, leafy greens, thyme, & real salt! Certified vegan. vegan.org. GF: Certified gluten-free. Non GMO project verified. nongmoproject.org. Hemp and greens and thyme - oh my! The yellow brick road we're traveling on here in Kansas is full of great taste, free of common food allergens and artificial ingredients, and reflects the diversity needed for a healthy body, world and economy - 'cuz there's no place like home. Loving you and wanting you to feel good! - Hilary Brown, Founder & President. Facebook: Like us! HilarysEatWell. Twitter: Follow us! At HilarysEatWell. For recipes and more go to: www.hilaryseatwell.com. Product of USA.